"Did you forget to write that down?" "I know that I called and told you about that!" This is inevitable in any business, much less a business in the event industry where there are so many people and moving parts. With Inspherio, however, we provide you with ample tools to make sure that everyone inside and outside your business is on the same page. With Inspherio's unique Know Your Event - or KYE - questionnaire, you greatly diminish the probability that you will have the wrong information from the client. Each person that you work with will be assigned their own unique client portal. Within this portal, they can view their pricing packages, view and sign contracts, and view and pay invoices. But it is the KYE form that will save you the most aggravation. Within each person's individual portal, you can assign any number of questions, such as: event location, wedding colors, party theme, expected attendance, food allergies, music preferences, etc. (While you can set a standard questionnaire that you use for everyone, you can also edit it for each individual to cater to their specific needs.) The client logs in to their portal and answer these questions (especially if you mark them as mandatory). Once saved, the answers will show up within your own Inspherio account, organized and ready to go. Not only does this save you time and endless scrolling through emails and sticky notes, but it also limits that event day second guessing by the client. Since they are the ones who provide the information, any errors can be traced directly to them. Did I send the lead my pricing packages? What about the KYE form? Did the client sign the contract or pay their invoice? We know that surfing through emails and notes can be a pain. And you definitely don't want to have a disagreement with a client on whether they already paid an invoice or not. Inspherio helps keep everything clean and organized. You can and your client can both see exactly what the status is of the event and whether the ball is in the your court or the theirs. If you need to assign employees to specific events, you can do that easily in Inspherio. Within an individual event portal, simply select the "Assign Professionals" tab and select who you assign, their hours, and their pay rate or commission. Select to notify each employee of their assignment so that they will receive an email with the exact details. Did you forget who was assigned to which event? Simply go to your master calendar and check it out. If you have any inventory to deal with, I'm sure at one point or another someone has forgotten to put something on the load list or truck. With Inspherio, any items agreed to in a contract (such as a rental or sale product) will automatically show up in your inventory list. All you need to do now is add event products (such as tent stakes, serving utensils, or backdrops) that you need to carry out the event. Any employee that you grant privileges to view this page can easily see if everything is ready to go for the event. You can also assign employees to various tasks, set deadlines, and view the status of each one. Additionally, if either you or another account user need to add a note to an event, simply go to the notes page and everyone else (who you permit access) can view these notes as well. As you can see, staying organized and on the same page is easier than ever, and we've barely scratched the surface of the program. If you're new to the Inspherio family, start your free trial today and see how Inspherio can help you run your business that much easier. Across the country today, people are honoring our veterans in many different ways. Before we get to all the specials, check out one of the most famous photographs of World War II, edited by some very talented artists to bring the moment to life nearly 70 years later. To view more amazing photos like this, check out 22 Words. Across the nation today, there are some awesome examples of ways companies are going above and beyond to serve those who have and continue to serve us. The recently crowned World Champion Boston Red Sox will be honoring veterans and active military members with free tours of Fenway Park today. Brides Across America is teaming up with bridal salon, Couture Bride, to provide military brides the opportunity to make their wedding dreams come true by receiving a free wedding gown. This includes not only women in the military, but also any fiancé of a serviceman as well. Here is a list of several big name restaurants offering veterans with free meals and other deals. Today we honor and serve our veterans. Our service men and women, however, serve us every day. Shouldn't we do the same? 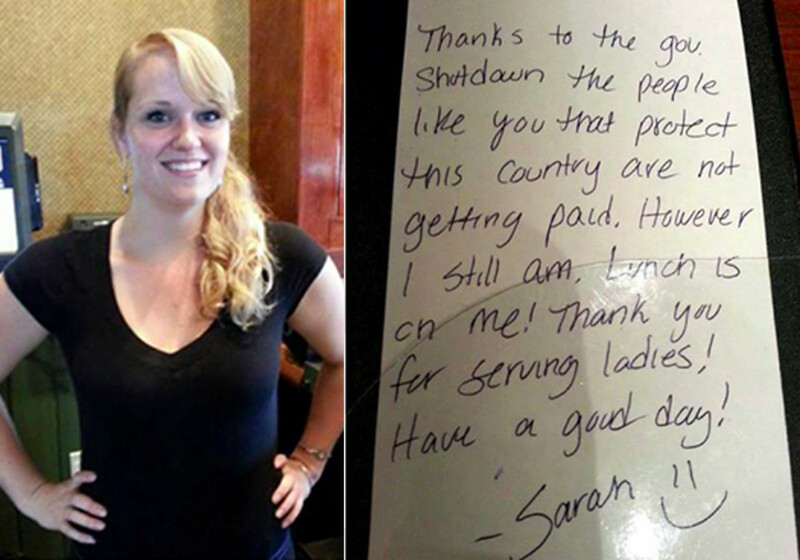 Take, for example, this woman, who covered the lunch tab of a service women. We here at Inspherio would just like to say "Thank you" to all those who serve us every day. Well, we're just past Halloween, which means that retails stores are - ridiculously - in full holiday mode. It seems they completely forget about Thanksgiving and go straight to Christmas...but I digress. There can be a lot of perks to planning a wedding during the holiday season, possibly a few more than your clients may have thought about. Wedding and event planners, below you'll find some great ideas from various bloggers that can really help out your clients and save them some good money. You may not think you’ll find much for your wedding amid all the discounted electronics and Christmas decorations, but great deals abound. Snag marked-down twinkle lights and candles to adorn your reception space, or food items to stuff into guest welcome bags. Look beyond the traditional red and green décor and sift for candlesticks, containers and vases in shades of white or metallics. One warning: This isn’t the best time to create or add to a wedding registry. Inventory is chock full of seasonal items, even products with no obvious holiday theme, that stores are trying to clear out. Plus, much of retailers’ regular inventory has been removed to make room, so the usual items aren’t available. You don’t want to spend an afternoon with the scanning gun just to find out in January that many of your items are out of stock. Whats the difference between a designer New Years Gown and a Bridesmaids Dress? Nothing! If you have not chosen bridesmaid dresses, gather up the girls for a fun day of shopping! During this time of the year, you will find fabulous styles on sale and if you only have 2-4 Bridesmaids. So you and your fiancée took some beautiful engagement pictures and it is a shame to keep them to yourself, so why not send out Save-the Date Christmas Cards. Make sure it is OK with your chosen photographer and use one of the quick and easy ways such as Shutterfly, Walgreen's Photos and many others to upload, design, print, and even mail them out! I have done this for family photo's and it takes minutes! If you're like most people, you've been invited to a slew of parties and open houses, and have a variety of what I call "random people" to buy presents for: work colleagues, the mailman, the kids' teachers. When you're shopping for wedding favors, keep an eye out for gifts to buy in bulk. Consider boxes of chocolates, bottles of olive oil, or bath products, or goofy gifts from Oriental Trading Company. And, if you're buying the wine for your wedding yourself, order an extra case to take as hostess presents. You'll thank me later, when you realize there's yet another party to go to! Having people to your house or throwing a party? Now is the perfect time to try-out a wedding caterer, cake baker, or florist. If you're going the DIY route, you'll have an assembled audience to help you make sure not all 50 pieces of wedding cake go to waste. For those considering DIY flower arrangements, many online flower sellers offer a "test bunch." Order it before a big party, and hit two birds with one stone. Not only will you have inexpensive arrangements for your party, but you'll find out if you're really capable of doing your own flowers, and get some practice before the big day.